The antibody recognizes both phosphorylated and non-phosphorylated forms of NF-H. Specifically recognizes the heavy microfilament subunit (~180-220 kDa). Full length native protein (purified) corresponding to Cow Neurofilament heavy polypeptide. From bovine spinal cord. IHC-PerfFo: Rat brain tissue. ICC: 33B cells. 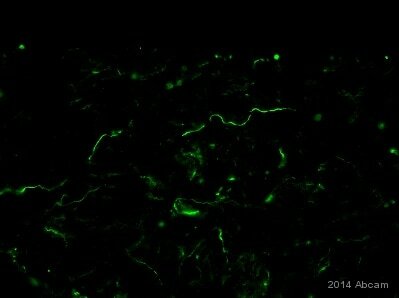 IHC-P: Neurofilaments. 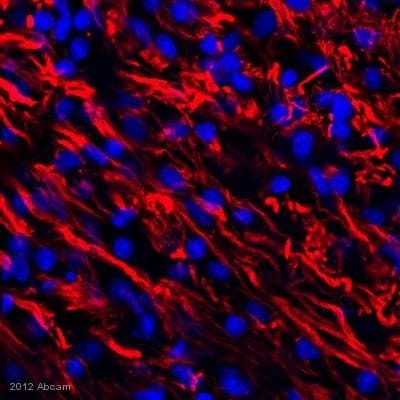 IHC-Fr: Rat aged muscle tissue. WB: Mouse and rat brain and spinal cord tissue lysate. IHC-FrFl: Mouse hippocampus tissue. Our Abpromise guarantee covers the use of ab8135 in the following tested applications. Defects in NEFH are a cause of susceptibility to amyotrophic lateral sclerosis (ALS) [MIM:105400]. ALS is a neurodegenerative disorder affecting upper and lower motor neurons, and resulting in fatal paralysis. Sensory abnormalities are absent. Death usually occurs within 2 to 5 years. The etiology is likely to be multifactorial, involving both genetic and environmental factors. There are a number of repeats of the tripeptide K-S-P, NFH is phosphorylated on a number of the serines in this motif. It is thought that phosphorylation of NFH results in the formation of interfilament cross bridges that are important in the maintenance of axonal caliber. Phosphorylation seems to play a major role in the functioning of the larger neurofilament polypeptides (NF-M and NF-H), the levels of phosphorylation being altered developmentally and coincident with a change in the neurofilament function. Phosphorylated in the Head and Rod regions by the PKC kinase PKN1, leading to inhibit polymerization. 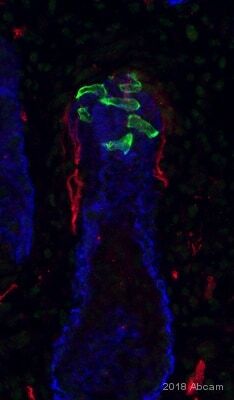 Immunohistological analysis of a mouse hippocampus section stained with ab8135 at a dilution 1:2,000 in red, and co-stained with a mouse mAb to myelin basic protein (MBP) at a dilution 1:5,000 in green. The blue is DAPI staining of nuclear DNA. Following transcardial perfusion with 4% paraformaldehyde, brain was post fixed for 24 hours, cut to 45 μM, and free-floating sections were stained. ab8135 staining Neurofilament heavy polypeptide in rat brain tissue sections by Immunohistochemistry (PFA perfusion fixed frozen sections). Tissue was fixed with formaldehyde, blocked with 5% serum for 1 hour at 25°C and permeabilized with 0.1% Triton X-100. Samples were incubated with primary antibody (1/500 in diluent) for 12 hours at 25°C. 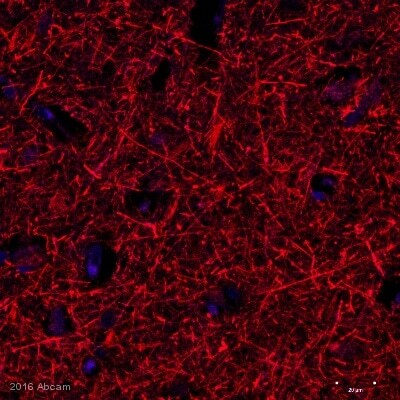 An Alexa Fluor® 555 goat anti-rabbit polyclonal IgG (1/300) was used as the secondary antibody. Immunocytochemistry - Anti-Neurofilament heavy polypeptide antibody (ab8135)This image is courtesy of an anonymous Abreview. 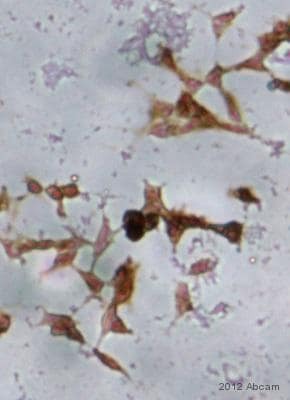 Immunocytochemical staining of 33B cells (Rat oligodendroglioma) with ab8135 at 1/1000. Cells were cultured in DMEM/10% FCS on coverslips in 12 well plates. Cells were washed with PBS and fixed in 4% PFA until staining. Cells were washed teice for 2 minutes and then treated with 3% hydrogen peroxide in methanol for 15 minutes at room temperature. The sample was blocked in 10% goat serum in 1% PBSA and then incubated with the primary antibody in 1% PBSA for 2 hours at room temperature. A biotinylated goat anti-rabbit was used as the secondary at 1/200 and then incubated with ABC for 30 minutes at room temperature, followed by DAB in PBS (brown). The sample was counter-stained with hematoxylin. 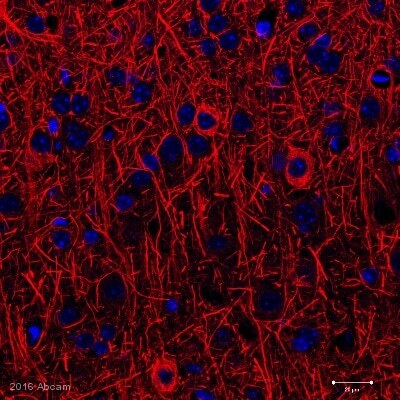 The image showing results obtained after protease pretreatment, illustrating high definition neurofilament staining. This picture was kindly supplied as part of the review submitted by Prof Colm Cunningham and Dr Suzanne Campion (Southampton University). ab8135 at a 1/500 dliution staining rat aged muscle tissue sections by IHC-Fr. The tissue was permeabilized with Triton X-100 and blocked with 10% serum for 30 minutes at 25°C. Then incubated with the primary antibody for 1 hour at 25°C. Muscle was stained without fixation and post-fixed in 10% NBF following staining for 1 hour. 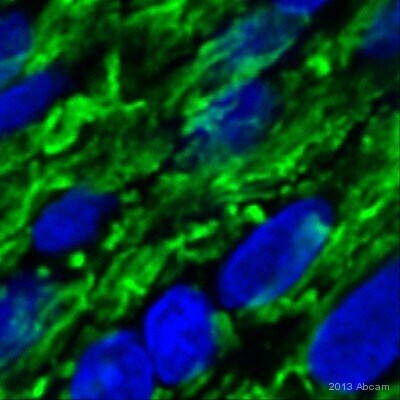 Green: alpha bungarotoxin stained post-synaptic neuromuscular junction. Publishing research using ab8135? Please let us know so that we can cite the reference in this datasheet.